Victoria falls 5-3 to Seattle; rematch tomorrow night. season-high 44 shots at home. Royals – Kody McDonald 1g-1a, Kaid Oliver 1g-0a, Scott Walford 1g-0a, Jameson Murray 0g-1a, D-Jay Jerome 0g-1a, Brandon Cutler 0g-1a, Igor Martynov 0g-1a. Seattle – Matthew Wedman 2g-0a, Payton Mount 0g-2a, Jake Lee 1g-0a, Owen Williams 1g-0a, Cade McNelly 1g-0a (Game Winner), Tyler Carpendale 0g-1a. Royals – Brock Gould (L) – 58:24 mins, 16 saves on 20 shots. Seattle – Roddy Ross (W) – 60:00 mins, 41 saves on 44 shots. Shooting Gallery: In this evening’s contest against Seattle, the Royals recorded 44 shots, which is now the season-high for shots on home ice. The previous high for shots in a home game was set on September 28, 2018, when Victoria fired 38 shots against the Kamloops Blazers. Outstanding Oliver: With his goal tonight, Royals’ forward Kaid Oliver has lit the lamp 20 times this season. He now leads the team in goals scored. Former Teammates: In the 2014-15 season, Royals’ defenceman Mitchell Prowse and Thunderbirds’ forward Keltie Jeri-Leon won the Canadian Sports School Bantam Hockey League (CSSBHL) Championship, while teammates on the Okanagan Hockey Academy Bantam Prep Team. 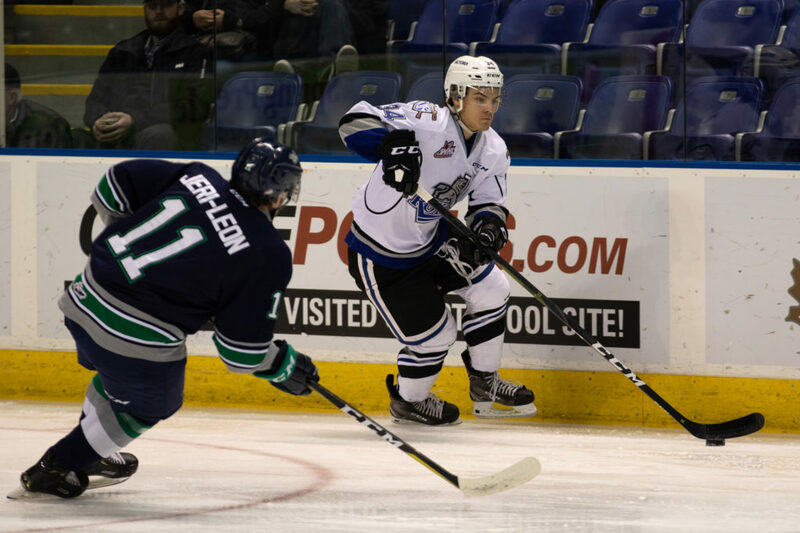 Island Connection: Tonight, Thunderbirds’ forward Payton Mount, a product of Victoria, BC, collected two assists against the Royals. The 2002-born forward grew up playing minor hockey for the Juan De Fuca Grizzlies. Looking Forward: The Royals face the Seattle Thunderbirds tomorrow night, which will mark the last time these teams battle it out at the Save-On-Foods Memorial Centre during the regular season. After that, the two clubs will complete their four-game regular season series in Kent, WA on Friday, March 8th. Up Next: Victoria concludes their four-game homestand with a contest tomorrow night against the Seattle Thunderbirds at 7:05 p.m. Tickets can be purchased in person at the Select Your Tickets box office, over the phone by calling 250-220-7777, or online at www.selectyourtickets.com.